Gyula Várnai borrowed the title of his new exhibition at the acb gallery from Carl von Linné’s volume published in 1735. Linné’s work created a new paradigm of learning about nature and the system of taxonomic classification, thereby becoming the father of modern scientific systematization. 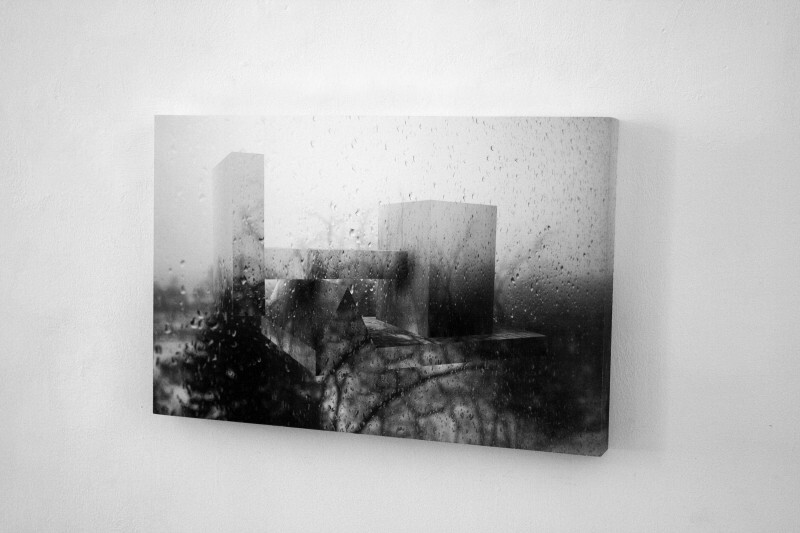 Gyula Várnai’s featured artworks, similarly to many of his previous pieces, deal with the various aspects of learning and cognition – from the act of perceiving and registering to fitting the cognized information into a system – and also indirectly reflect on the conditioned patterns of modern scientific thinking, which have become unsustainable. 1. Observation – The first step in the process of acquiring knowledge. Várnai’s installation, which fills the entire room, consists of a curtain composed of matchboxes that are stringed together, and a video of cloud formation. 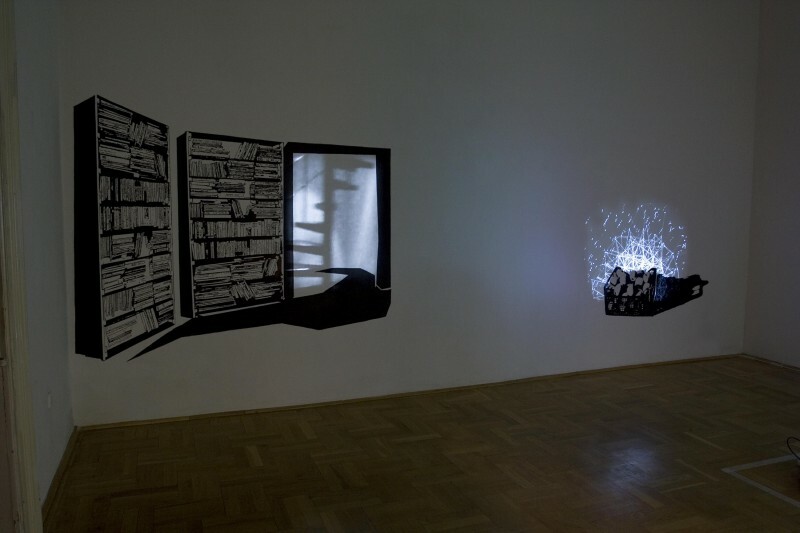 The image is projected onto the curtain, which is perforated in the shape of a cloud. In the resulting effect, instead of the video image, the viewer sees the contours of the cloud on the wall of the exhibition space. The work indirectly alludes to the limits of objectivity in observation and the non-neutral role of both the organ of perception that transmits the information and the instrument that is used. The installation could also be seen as reminiscent of Plato’s allegory of the cave. 2. Registration – In our day and age, taking photographs is a primary and simple method for recording the surrounding environment. Most phenomena constitute suitable subjects for photographic documentation, and photographs are commonly accepted as authentic imprints of reality. While in Várnai’s use of the camera the how and why of the selected spectacle is of significance, the non-traditional presentation of the captured images also carries similar weight. 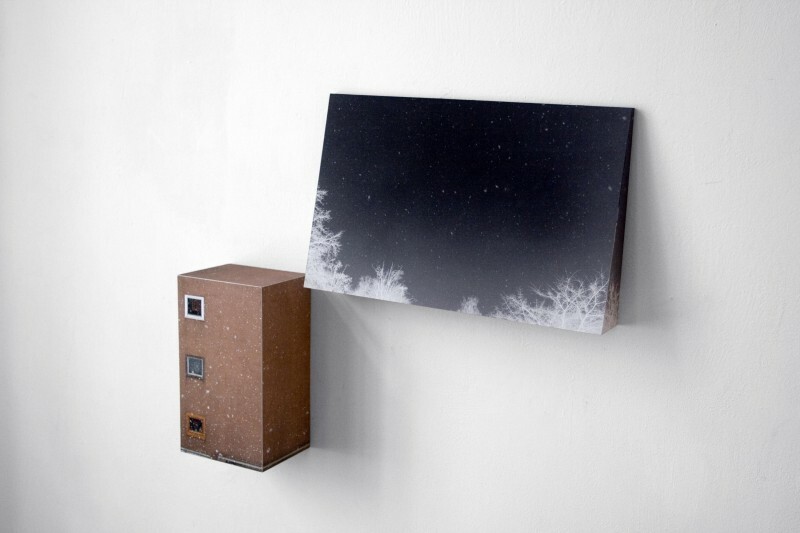 By applying his photographs of small phenomena from nature and the human environment to geometric bodies, Várnai creates objects, where the planarity of the photo on the three-dimensional shapes appears almost as an inversion of space. 3. Systematization – For summing up experiences and observations, classification – the formulation of a system – is an indispensible step. Instead of relying on the two-dimensional models offered by the great systems of modernity, Várnai’s system is more akin to the kind of multi-dimensional structures which can be traced in human thinking and which cannot necessarily be described through the laws of logic. We are offered a glimpse at the visual articulation of Várnai’s system through the wall drawings and superimposed, projected images presented in a darkened room of the gallery.